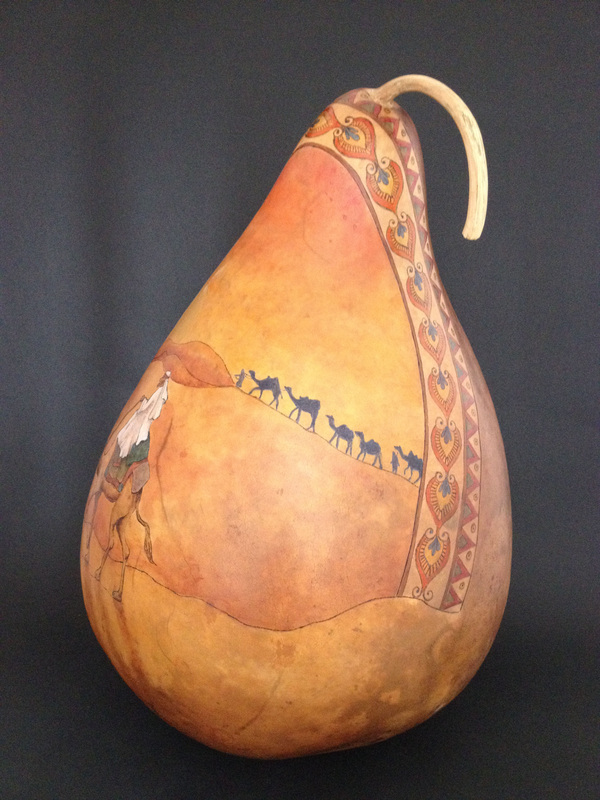 This gourd was started in a class that Mary recently took from Bonnie Gibson of Arizona Gourds. After working on it for an entire day in class, and another day or two at home, she was at the stage shown to the left. It took several more hours to complete this piece. 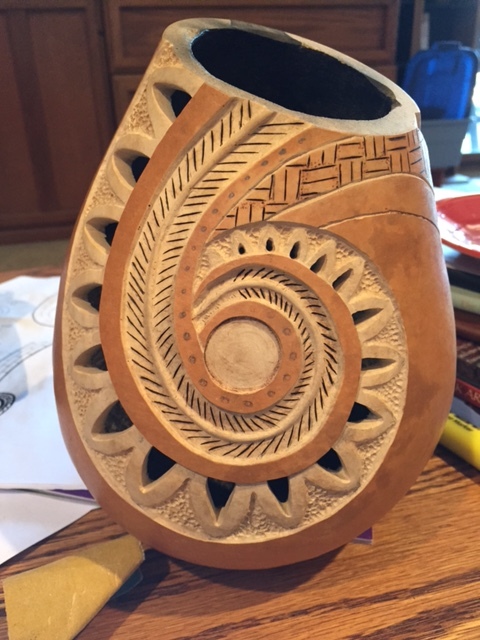 This gourd vessel was started in a class with Bonnie Gibson of Arizona Gourds. The finish is a textured paint which gives the illusion of suede leather. The beading isn't really beads, either, but it sure looks like it! 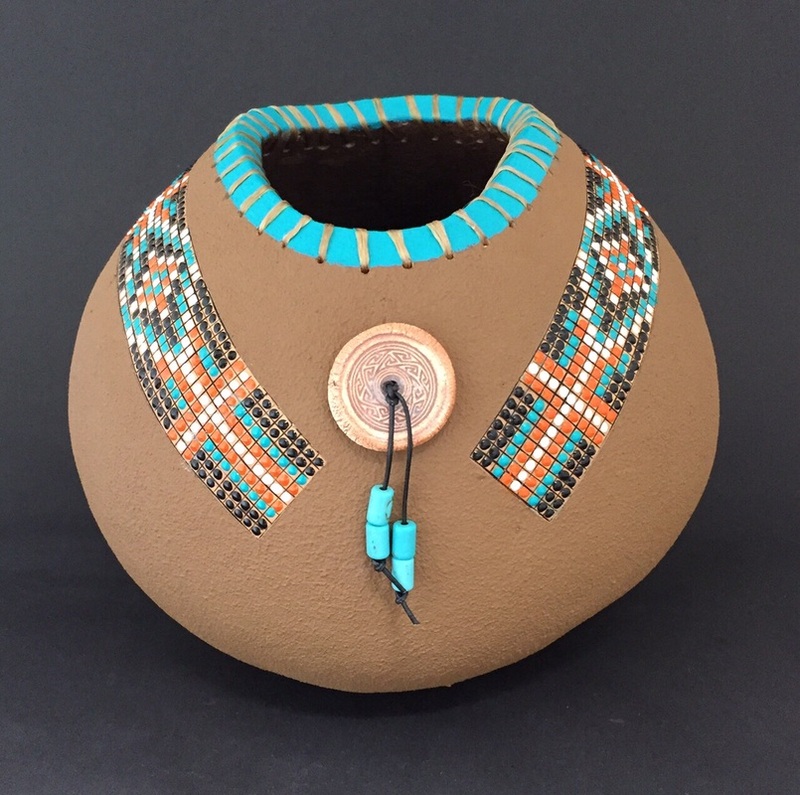 The center embellishment is a ceramic cabochon in which I drilled a hole for attaching with round leather cord. 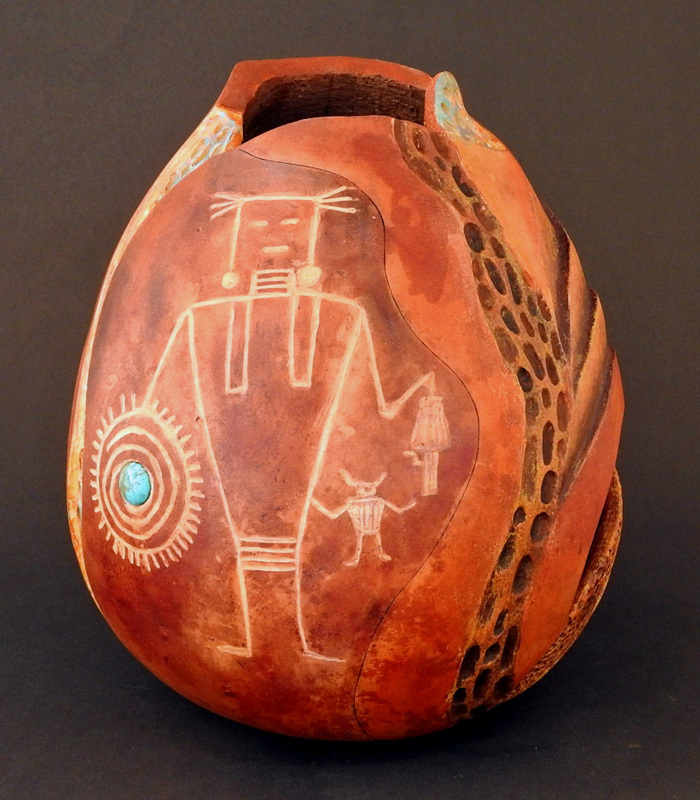 Inspired by our recent trip to Utah, this gourd honors the fascinating petroglyphs and pictographs found on the stunningly beautiful red rock formations. 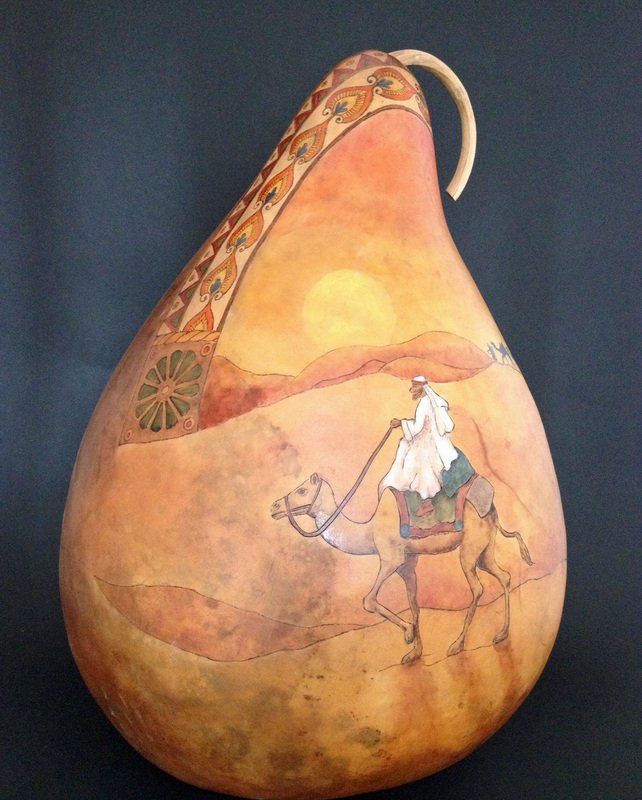 Created for a recent art show with a "water theme," this water maiden is created from 3 gourds and is mounted on a painted gourd shard. 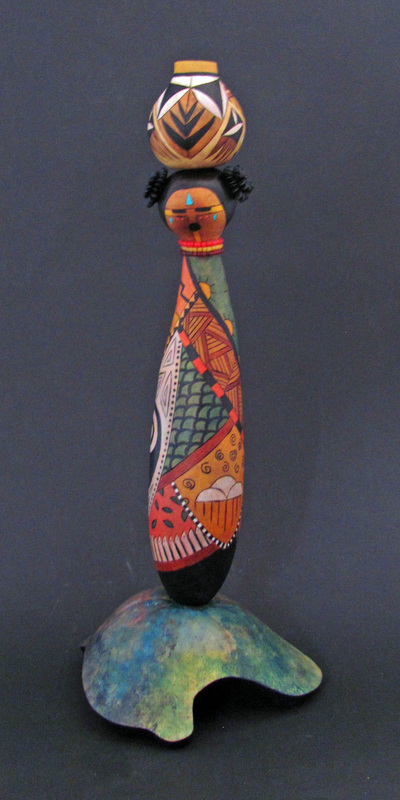 She is 14 inches tall, pyrographed and painted with ink dyes and acrylic paints. 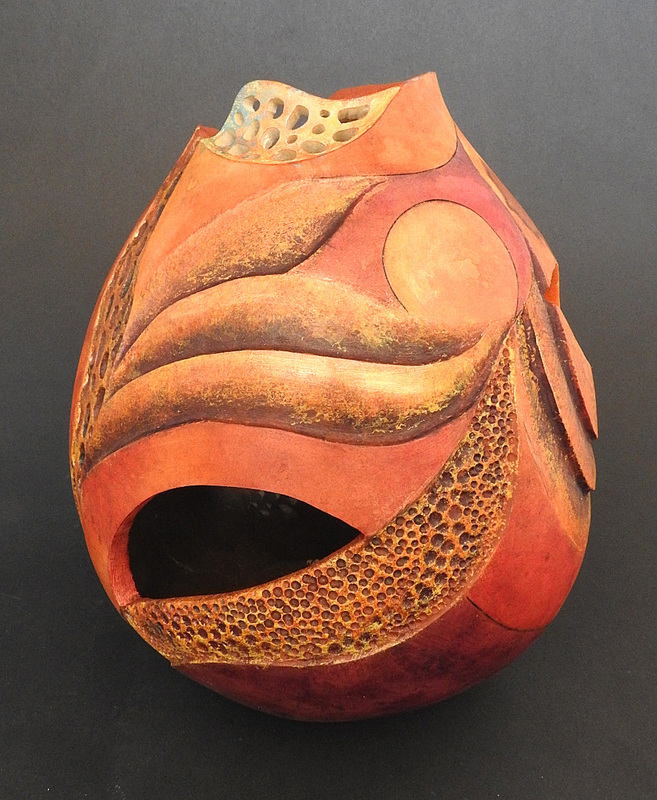 Winner of 2nd place in 3D/Sculpture at the The Arts Colony "Water" Show. 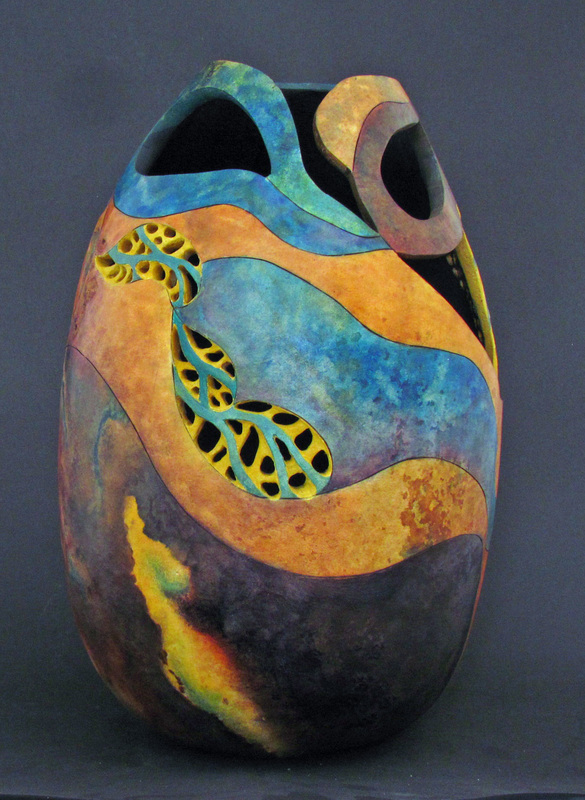 ﻿Standing 12" tall, this piece was created for The Arts Colony "Water" Show. 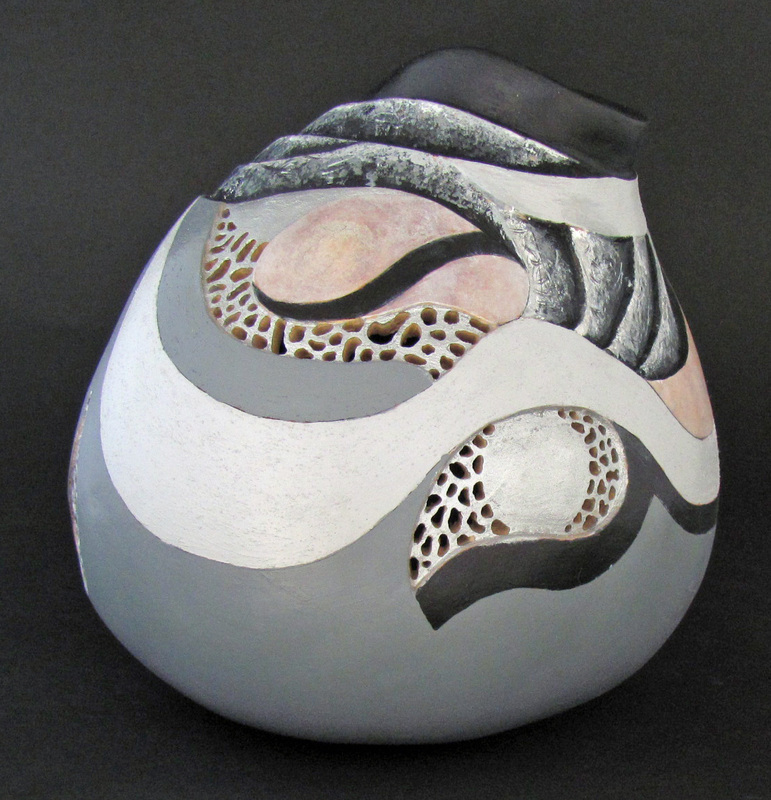 Creating this work became a meditation on the current drought situation in our state. 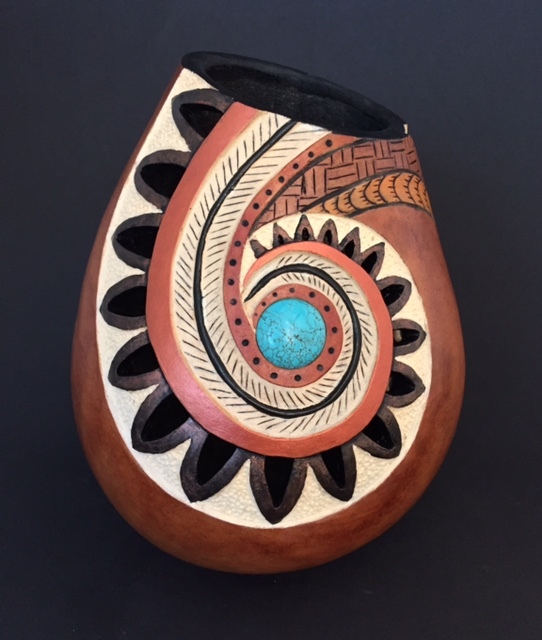 Southwest style gourd vessel with specially cut opening, faux basketry carving and inlaid turquoise. Pyrographed and painted, highlighted with patina. This one has already found a special home in Arizona. 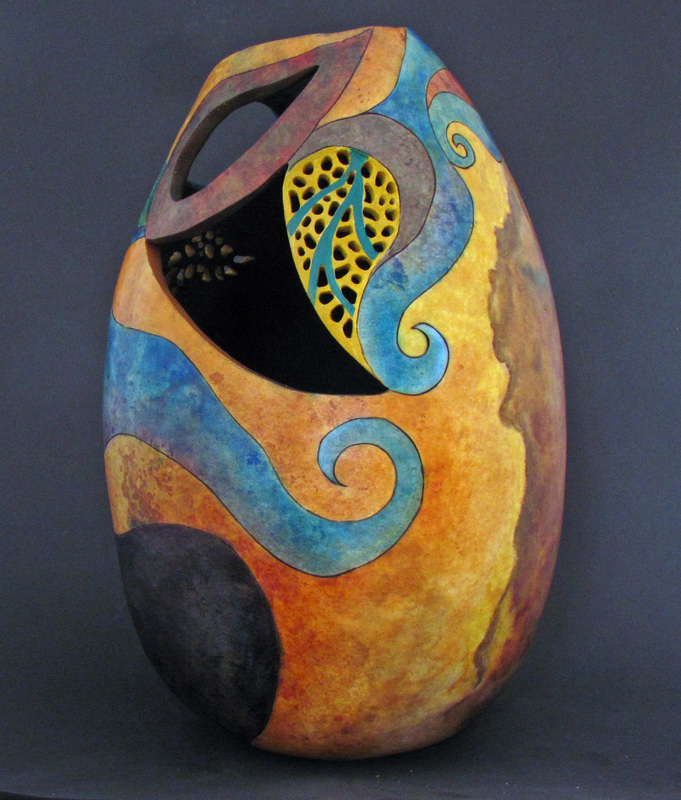 Created for the Dawn to Dusk show at The Arts Colony, Corona, I made this during the days that a large wildfire was burning in the mountains near our home. The beads are antiqued copper. A lone rider crosses the desert on his camel, with a caravan in the distance. Pyrographed and painted with ink dyes. 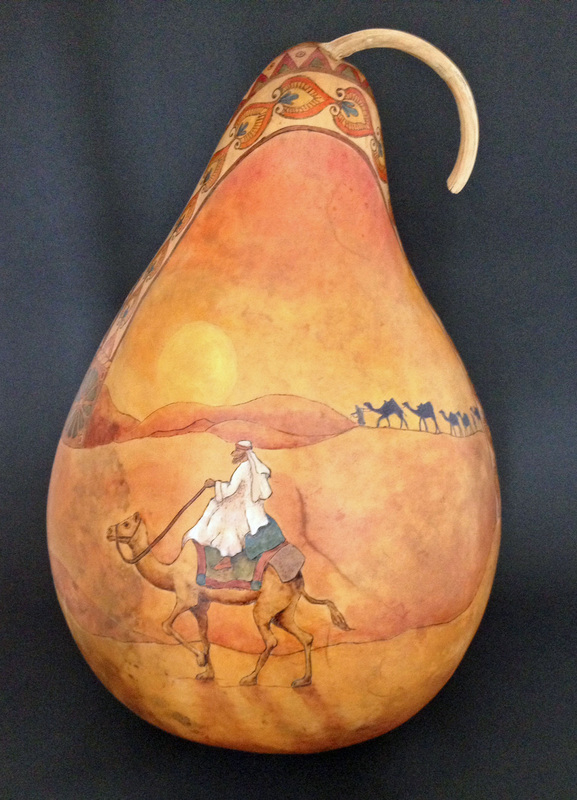 This gourd is for sale here. 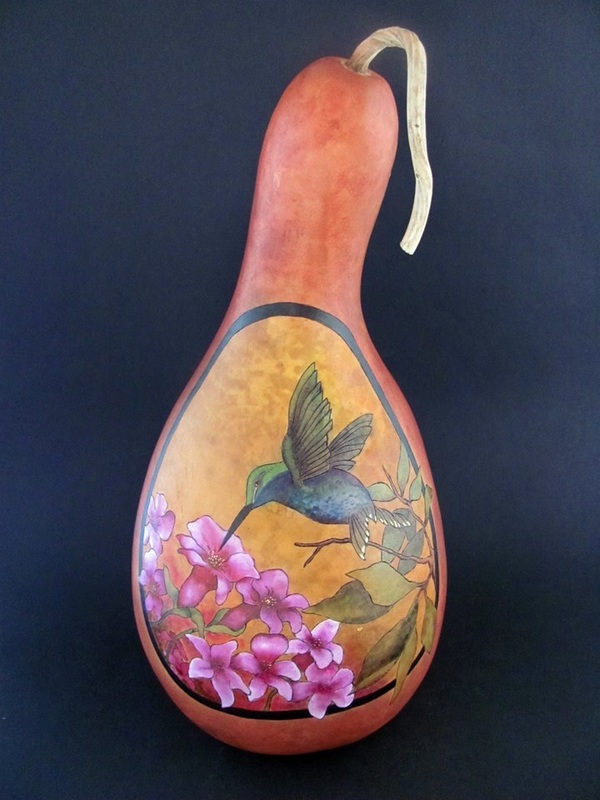 I enjoyed making a commissioned hummingbird design so much that I made another. This one is for sale here. 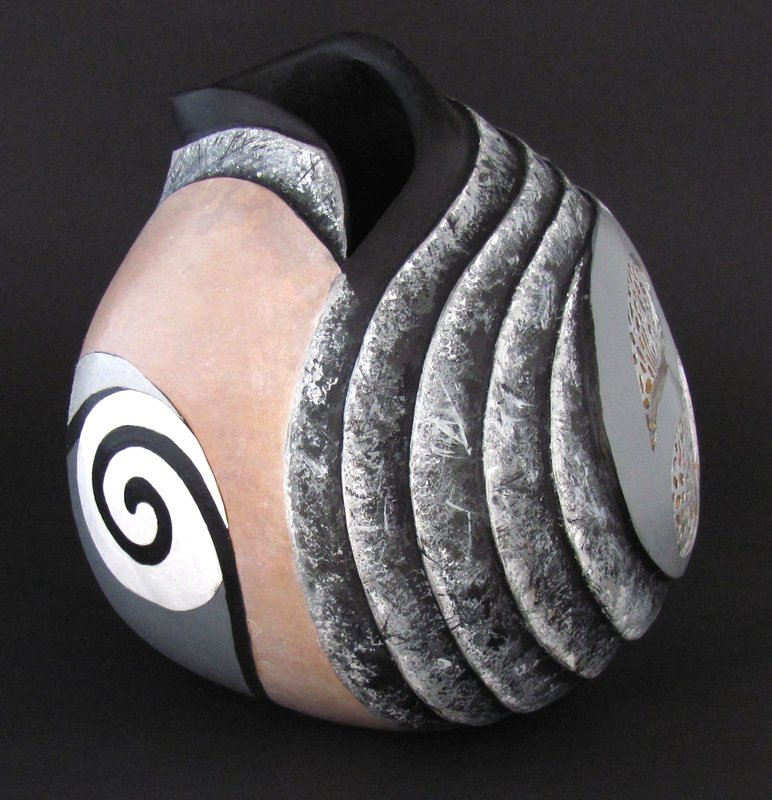 This gourd was created for the "Black Gray White" show at The Arts Colony. It was a fun challenge for me because I love color. I am very happy with the result. 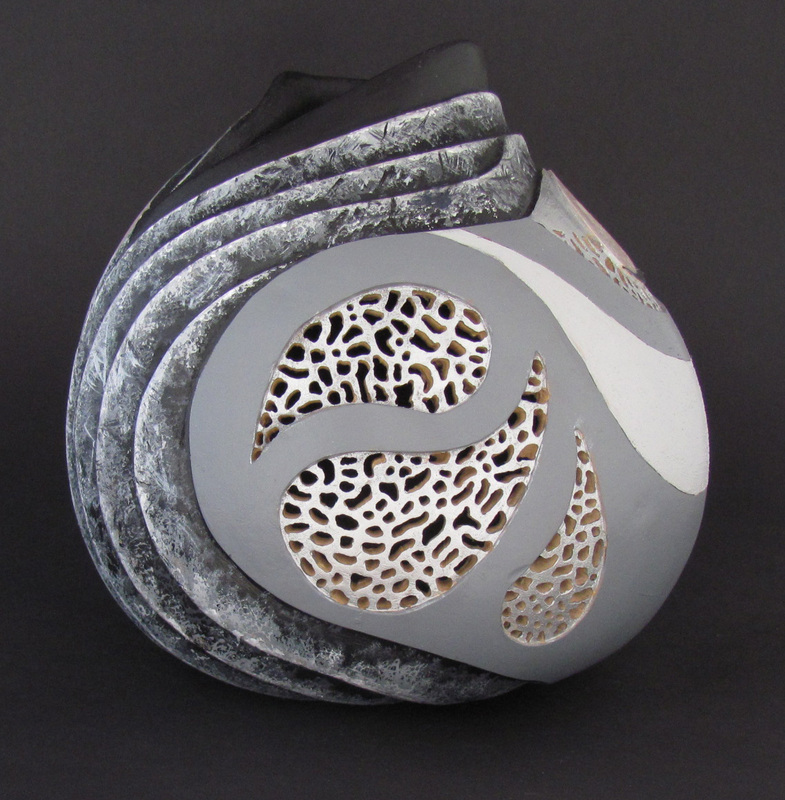 Wave and filigree carving are highlighted by silver paint.